Blogger has a very small window for composing text. If I am writing a long story, trying to work in this small window is trying. Google also offers an on-line word processor, nothing fancy, just a step above a text editor, but it works pretty well. Most importantly it gives you a big window to work with. For my last post about the murder mystery, I did most of my work over there, then copied and pasted it into the blogger text window. However, one thing did not get copied over. Using the word processor, I had indented the first line of each quoted paragraph using the tab key. When I copied it over to blogger, this indenting disappeared. This class apparently has something to do with whatever program is displaying the page. Google's word processor knows what it means, but Google's Blogger doesn't. Why isn't indenting a standard html function? And why does Blogger indent the title and the first line of every article, and only the first line? That might be a function of the template I'm using, but still. I was brought up to treat books as sacred, or at least semi-sacred. You didn't write in them, you didn't deface them, you took good care of them. Probably because they were library books. Still, those were the rules. For the last ten or twenty years I've been buying books, mostly in the bargain bins. Occasionally I will find an author I like and buy a new book, but I'm not really keen on spending a lot of money on a book. I would just as soon have a used paperback (as long as the pages aren't falling out) for a couple of bucks than a new hardback that cost me $25. Recently I have started to notice what I was reading, instead of just consuming a book like a TV show. I started to notice particular passages that I thought were well written or illuminating. I also found that unless I made note of exactly where I found that passage, it was almost impossible to find it later. All this combined in my latest read. I picked up a used paperback copy of this book somewhere, probably cheap, maybe even free. It's kind of old and beat up. I'm not sure why I picked it up. I certainly didn't like the title. I mean, I like dogs, why would anyone want to drown them? But it was a murder mystery, and paperback versions of murder mysteries are usually pretty good entertainment. This book was a lot more than I bargained for, however. It was full of interesting passages and history, and since it was a cheap old paperback I overcame my inhibitions and marked it up as I saw fit. I read this book twice, once in January and again this month. After I finished the first time I could not remember how it turned out. Reading it again was just as enjoyable as the first time. How it turns out is really of no consequence. The murder mystery is really only a frame to hold this portrait of Irish history and the Irish people who made it. It's a story of haters and the propogation of that hate, as opposed to those who are willing to forgive. It explains a lot about the way the world is and why there are so many places that never seem to get over their hatred. This story is very well told. Here are some of the more memorable passages. I have commented on some of them. Some of them are just great all by themselves. This reminded me of "Poland" by James Michener. Poland has a history of being overrun by one country after another. Russia, Austria and Germany all took a turn at it. 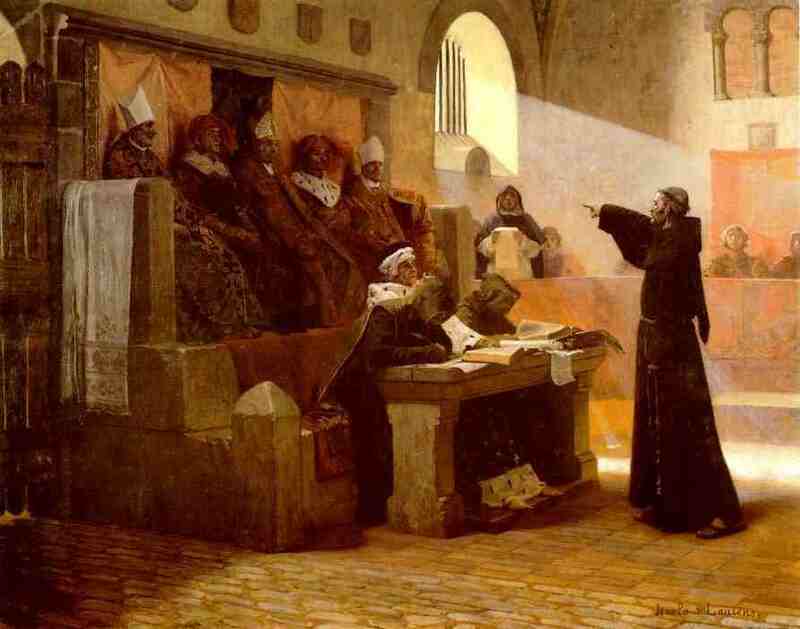 Poland had a democracy of sorts early on. Problem was it took a unanimous vote to get anything done, and as disagreeable as people are, seldom did that ever happen. I suspect Ireland had a similar problem. They did not have a strong leader who could get the people to band together to fight their common enemy. They were too busy arguing among themselves. "I'd just walk into the theater whenever, right in the middle of a picture; it didn't matter. I could always stay on past the end, and wait for the next performance - until I caught up with all the scenes I'd missed at the beginning." I found this curious. I never went to the movies like that, and I don't know of anyone who ever did. I don't know if I am an "upstream swimmer", but I suspect I am at least a cross current swimmer. "Mum knew very well what she was doing. She was intoxicating us. Curiosity drunked us more than whiskey ever done to Daddy. Furthermore, every time the old man's back was turned, and many a time it wasn't, she'd feed us subversive notions. "She had certain visions of us, and meant us to see the same. We were both of us bright and worthy, she decided, but different as could be; I was her practical one, Aidan possessed a mind in need of soaring. For an Irish peasant woman to have such dreams, and to be able set her boys on a path to achieve such dreams, that is the real miracle. You read about these in the papers occasionally. Sad stories, all. "There's a line in the novel spoken by the character Thomas Hudson, from his deathbed: I was just beginning to learn there toward the end. No one thing is true - it's all true." I only included the first paragraph to give context to the second. Thomas Hudson is a character from Ernest Hemingway's book "Islands In The Stream" . Cavanaugh said, as if to a dim student, "We learn from history that we do not learn from history." "And so it's all just - nothing?" I had always heard that those who do not learn from history are doomed to repeat it, and as we see it being replayed over and over again, I think fictional Cavanaugh has it right. I shook his hand, and said, "Hockaday. Nice eyeshade." "Thank you. Nice Yankees cap." That happens to me occasionally, and sometimes the reverse. How about you? I turned over the medallion. "And the verse reads, 'When nations are empty up there at the top ... When order has weakened or faction is strong ... Time for us all to pick out a good tune ... Take to the roads and go marching along'?" "Hock, what is all this crap anyways?" "You're leading now to the Dublin Men's Society of Letters?" "Exactly. I'll get to that footnote directly. But you should first know that what was hardly obscure - then or now - was the basic contempt Yeats held for the Irish government in which he himself served as a senator in the twenties. Oliver, you'll recollect from my class what Yeats called Cosgrave government ?" So, Gunston was a prize student. Yeats and Cosgrave are real parts of Irish history, the "Dublin Men's Society of Letters", not so much. Up until we get to the part about the Bishop of Canterbury, I thought it was a fair prayer. And okay, the Catholic Irish don't like the Anglican English. But after that, geez, it sound more like a voodoo curse than any kind of prayer. Do people really pray like that? 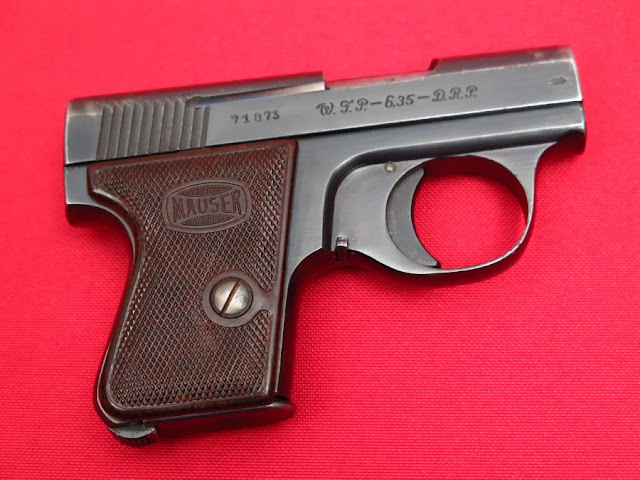 This pistol is mentioned several times in the book. Links to more bits of history that are mentioned in the book. This line appears several places and was apparently written by Yeats and appears in his book Samhain. "We wish to grow peaceful crops, but we must dig furrows with the sword." 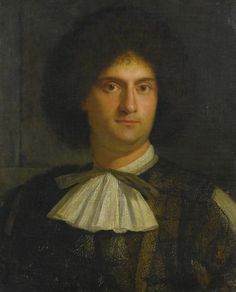 These paintings are mentioned early on when Hockaday arrives at his Uncle's house outside Dublin. I did not find it on the net, but I did find this one. 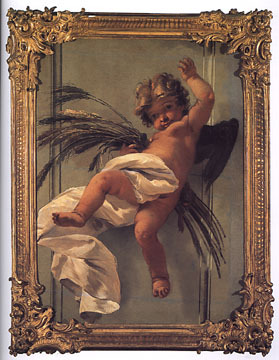 This is one of a pair of paintings by Tiepolo that sold for a million bucks back in 2000. 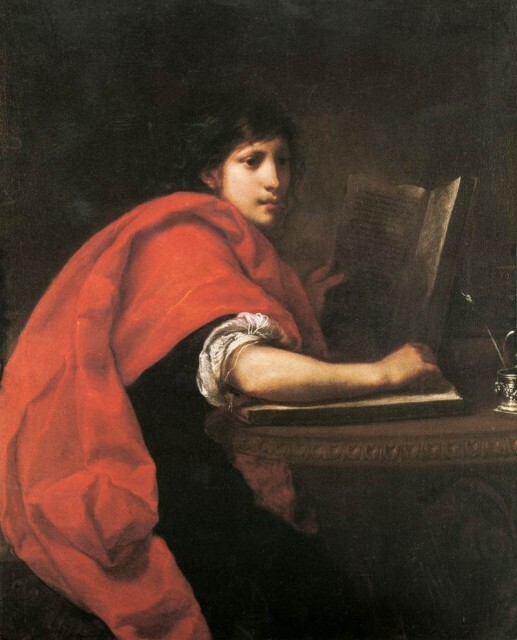 This picture is by Furini, but it is a picture of St. John the Evangelist. I found pictures of St. Sebastion, but not by Furini. Update March 2016. Replaced one missing picture. Update October 2016 replaced one missing picture with larger one. Dennis has been recording our lunches for the last few weeks (using his fancy schmancy digital pocket voice recorder), and he finally uploaded one to the web. It is five or ten minutes before the conversation gets going, but after that it's pretty steady. There is a loud background rumble. It would be nice to get rid of it, but hey, one step at a time. 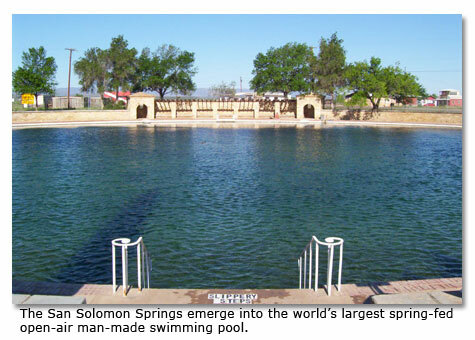 Scuba diving in West Texas? Amazing what you run across on the internet. So I am reading Tam's blog and she's talking about some cops going to prison for killing a 92 year old woman some years ago. I follow some links, and I end up with a letter from the really famous Milton Friedman to the supposedly well-known Bill Bennett (never heard of him myself), deploring the evils of drug prohibition. No matter what good Christian Churches say, love doesn't hold a candle to hate. Sometimes I think this country, nay, the whole world, runs on hate. Hate is easy to provoke and perhaps even easier to direct. Those people, those guys over there, they are the problem! They must be made to pay! I don't know if things are ever going to get any better. More people and more crowding and more competition leads to more stress, which leads to more anger and more hate. I had whole batch of old memories resurface this morning about people who angered me. The whole episode came back with crystal clarity, including my feelings of anger. I soon found something else to think about and that episode faded from my mind. I wonder if this is what the war on drugs is really all about. Keeping people keyed up and on edge and ready to hate makes them easy to direct and control. People who are laid back and relaxed are not going to be quite so ready to take directions. Update September 2015 replaced missing picture. Mr. Dustbury tackles the Detroit bashers with some of his high octane vitriol. Go, Chaz! 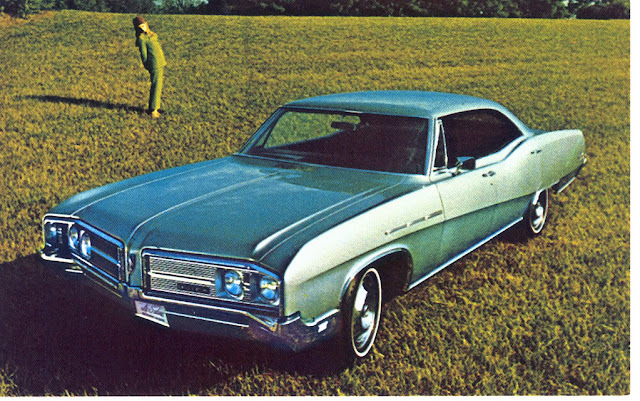 One winter day back in Ohio I was driving my Dad's 1967 Buick LeSabre down Route 661 near McKean school and there was a big snowdrift across the road, untouched. I was familiar with these. They were light and puffy, no real obstacle, just push on through them. But this one was pretty big, two or three feet deep, completely covering my lane of the road and some length, maybe 50 feet. I didn't want to get stuck in it, and I didn't want to have to futz with it, pushing gently into and backing up, and pushing again, so I ran into at full tilt, 50 or so MPH. There was a little jolt as the car hit the snow and then the snow exploded and everything turned white. But I was right in my estimation that it was not substantial, the car went all the way through. I made a mistake though, I let off the gas. This let the rear wheels slowed down, and when we came out the other side and hit the asphalt there was hell to pay. The tires were screeching and the back end of the car was slewing left to right and back again. I was lucky there was nobody else on the road, because I was all over it. Lucky I didn't go in the ditch. Update June 2016 replaced missing picture of the Buick. Replace picture of the school because Blogger was complaining about some kind of problem sending it over https. Satellite view of the school here. Learning to use a new software program is like going into someone else's kitchen and trying to fix a meal. You know they have everything you need to get the job done, but you have no idea where they have hidden it, so you spend all your time looking for the stuff you need. And if they happen to be a little out of the mainstream (aren't we all?) the tools they have will be almost unrecognizable and stored in really strange places. I've been playing with Eclipse, which is a program for software development, and it is a lot like that. Plenty of buttons right up front that do things that either I don't want or need, or else they do things that I do not even comprehend. All the "simple" stuff, is buried in obscurity and requires the patience of Jobe (is that the right reference? Jobe?) to locate. I have been using Microsoft's Visual Studio (Microsoft Visual C++ 6.0, actually) for the last ten years or so, and I have become used to the way things are done there. But it is Microsoft's, and I really don't want to be there, so Eclipse it is. And I am learning, slowly. I've been able to compile and debug some simple programs, and I have learned to deal with some of the quirks. What I really need though, is a bigger screen. Until I learn what all this stuff that is cluttering up the screen is, I am reluctant to delete any of it. Shoot, at this point I don't know if I could delete it. I think I am going to try and go to a dual screen setup, which means I am going to have to do some major rearranging in my office. Another chore to add to my infinite list of things to get done. Update January 2107 replaced missing picture. Pretty much been the story of Western civilization since the dawn of the industrial revolution. Maybe longer, but we're not going to worry too much about that. Somewhere I heard that in the New Testament Jesus talked about money more than any other subject. So, yes, I guess, it does go way back. (Jesus walked on the water and I know that it's true...). When you are making things to sell, it makes good sense to make your production costs as low as possible so that you can make more money. After all, you aren't usually making this stuff for your health, you're doing it to make money. Making some things has a high material cost, some things have a high labor cost. Capital comes into play in a couple of way. The first one in is in having enough money for your payroll until you start selling some things. You may or not need capital for material. You might be able to get it on credit, depending on who you are. But you definitely need it for payroll. The second way it comes into play is in reducing cost. If you can buy a machine that will enable you to produce the same amount of stuff but with fewer people, you can cut your labor costs. Or it can enable you to do more processing of the incoming material so you can get closer to the source. Either way you save money. The first thing you have to do is pay for the machinery. If the machinery is worth while, it will continue to save you money after it has been paid for. The Western world has been making tremendous investments in machinery. Volkswagen recently built a new automobile factory in Germany to the tune of a billion dollars. The factories used to build computer chips cost several billion dollars. These are just the ones we hear about. Then there are all those factories that make up our industrial infrastructure. Steel plants, chemical plants, assembly factories, plants for making machinery for making stuff. It just goes on forever. Everytime you turn around there is some kind of machinery in the background making the stuff you are using. If even affects the Amish. I am pretty sure they use steel, and I am also pretty sure they don't smelt their own. This is all well and good, but now we have this tremendous industrial infrastructure and all this machinery being run by a handful of people to produce all the material goods we could possibly want. So what's gone wrong? I suspect part of the problem is that the more efficient a production bussiness is, the fewer people it employs. So we have fewer and fewer people making more and more stuff. The other part is that many manufacturing jobs have been shipped overseas. On one hand this is good. It means goods are cheaper here, and it provides employment in places that are very poor, financially speaking. On the other hand, it means many people are out of work over here. I think what's going on is that the more successful our industrial enterprise is, the more people we have who want a part of it. And the number of people is growing at least as fast as our industrial capacity. Credit is a funny thing. Basically the money that banks lend out is made out of thin air. The role banks play is to ensure that the money gets used for some kind of productive enterprise. The interest they charge is incidental. The more important part is they are breathing down the borrowers neck, keeping his nose to the grindstone, making him toe the mark. They are the new inquistion. If you do like Jesus says, and put your money to good use, you will be rewarded, you will be able to repay us, and all will be well. If you are not a good Christian and your enterprise fails, there will be no mercy on your soul. That's the role banks play. The biggest problem is that people cannot see into the future. No one knows what is going to happen, no one knows what the next big success is going to be. That's why capitalism is good. It puts large amounts of money in individual peoples hands and they get to decide what to do with it. Whatever they do, it's a gamble. It may pay off, or it may be the next black hole of doom. But whatever happens, it's their money, and it's their gamble. Committees are no good at this sort of thing. Committees are good for maintaining the status quo, but they are no help in trying to make any progress. 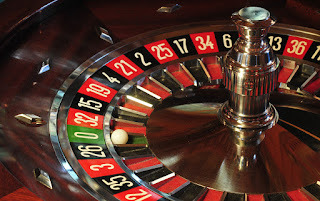 Lately, we've been making some bad bets, or, if you want to look at it another way, we've been making some long term investments that are going to start paying off, well, if not soon, then perhaps eventually. Things like Iraq and Afghanistan. There was also the housing gamble. That didn't work out too well. More of a Ponzi scheme than a real investment plan. Too bad. Problem with the War is that it has been funnelling money into relatively few hands. Some people are making tons of money off the war, and what do you do when you start to get a lot of money? You may buy some fancy doo-dads, but conventional wisdom is that you sock most of it away. Make hay while the sun shines, so to speak. So we have more money going into investments/big gambles. Some of those are going to fail and the money they absorbed will be dispersed. But a lot of it is going back into the military industrial complex. The government is saying this is the way to go, and right now a lot of money is being sunk into these wars. Eventually it may pay off, but right now it is just a big drain on the economy. The show was pretty good. It was kind of fun to see some of our old favorites from the silver screen live on TV. Some of the thank-you's were, er, interesting. The gay man getting an award for Milk and making a political statement. One Indian dude calling Mumbai Bombay, which made my imperialist heart glad. Another Indian dude closing with "God Is Great". DHS probably has him on their watch list now. Heath Ledgers parents and sister accepting his award. Hugh Jackman hosted and he was very entertaining. For some of bigger awards they would bring out five former winners to announce the contenders, and before that they would show a montage of clips from their films. Man, I have seen a lot of great films. So many I can't remember them all. The also had a memorial for the famous who had fallen in the last year. Some of them were surprising because I didn't expect them to be dead (Bernie Mac for one). Some were surprising because I thought they had died longer ago than last year (several). Paul Newman died. But his picture is still on the salad dressing at the grocery store and he's the picture of health. He can't be dead. Jerry Lewis showed up for a special award. Haven't seen him lately. He was walking and talking, though it seemed like it might have been difficult for him. He didn't stay long. Halle Berry was another person who showed up who I hadn't seen lately. She is still easy on the eyes. We didn't get to see the last three (and most important!?!) awards because the show ran over, and the stupid DVR stopped recording! We got to the end of the recording right as Sophia Loren was speaking, and we get dumped back to broadcast and the show is over! It's enough to make you want to seek revenge. Death to Verizon! Allah Akbar! 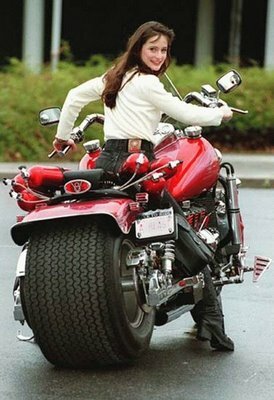 she's got this awesome motorcycle. Found on Marty North & Greenfield Park. The transition from one financial center to another typically lags behind broader shifts in the economic balance of power, Cassis suggests. Although the U.S. displaced England as the world’s largest economy well before 1900, it was not until after World War II that New York eclipsed London as the world’s preeminent financial center (and even then, the eclipse was not complete; in recent years, London has, by some measures, edged out New York). As Asia has risen, Tokyo, Hong Kong, and Singapore have become major financial centers—yet in size and scope, they still trail New York and London by large margins." This one about homeownership was surprising. And while homeownership has some social benefits—a higher level of civic engagement is one—it is costly to the economy. The economist Andrew Oswald has demonstrated that in both the United States and Europe, those places with higher homeownership rates also suffer from higher unemployment. Homeownership, Oswald found, is a more important predictor of unemployment than rates of unionization or the generosity of welfare benefits. Too often, it ties people to declining or blighted locations, and forces them into work—if they can find it—that is a poor match for their interests and abilities." Something to think about. He also mentions something about requiring banks to rent foreclosed houses. I don't think we need to do anything about foreclosed houses. If there are too many houses on the market, their value is going to fall. If a bank forecloses on a house, what are they going to do with it? Sit on it for months waiting for it to not sell? It's going to cost them two or three grand a month to do that. They could bulldoze it, but then they lose the whole value of the house (they would still have the land, which is maybe a sixth of the value). They could sell it on the open market for maybe half of the original price. I'm pretty sure they could find buyers then. But then they have to take an immediate hit on their books. Or they could change the terms of the mortgage so the current homeowner could keep the house. You know, something like cut the interest rate to, say 1%. Since the payments on new mortgages are almost all entirely interest, that would make a big difference. That would allow them to keep the property on the books at it's full value. Of course they are probably paying more than one percent to the Fed, which is where they got the money in the first place. But you know, if people aren't paying the loans you made to them, it doesn't really matter what the interest rate is, because when the aren't making any payments your effective interest rate is like minus one thousand percent. That is going to still make a big dent in their books, but it is likely to cost less than any other option. So if the bank is threatening to foreclose, make them an offer. Start with telling them you will only charge them a thousand a month to stay in the house and protect it from vandals and looters. You will probably need to go up from there, but give it a shot. With the large number of problem mortgages, they are going to be willing to listen to anyone who has any kind of solution. Due out in March. Via Rocket Jones and Dustbury. I'm out wandering around on the internet and I come across Ugandan Insomniac, which has a link to FOKO which has an interactive map that shows the current trouble spots in Madagascar. Go see it now before El Presidente shuts it down. I can't imagine any dictator worth his salt letting something like this continue. Went to the lab today to get some blood drawn and I learned a couple of things. Vampires always have a hard time with me. The have trouble finding a vein with their needles. Usually they can find one in my left arm, almost never in my right. This time they fail on the left arm, but this time he checks my right wrist and finds something he likes. He tells me that I have a vein that will certainly work. Not everyone has it, but for people who do (like me) he has never failed to get blood from it. He inserted his needle approximately where the word Cephalic is this drawing from Gray's anatomy. As he is about to poke me he tells me that the one draw back to this site is that it will sting a little. He was right about that. He used a syringe to draw the blood instead of one of those little vacuum bottles, the better to control the speed of the blood flow. Something about hemolizing (a process of disintegration or dissolution of red blood cells with liberation of hemoglobin). I need to remember to drink a couple of glasses of water before I come here next time. 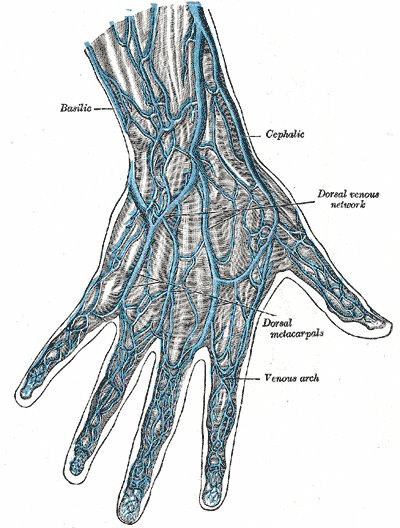 They tell me that will make it easier to find the veins. Staying warm also helps. Sandy can always find a vein, but she is the veteran there, and she only draws blood when she feels like it. 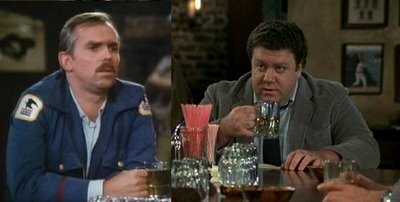 In one episode of "Cheers", Cliff is seated at the bar describing the Buffalo Theory to his buddy, Norm. I don't think I've ever heard the concept explained any better than this. "Well you see, Norm, it's like this . . A herd of buffalo can only move as fast as the slowest buffalo. And when the heard is hunted, it is the slowest and weakest ones at the back that are killed first. This natural selection is good for the herd as a whole, because the general speed and health of the whole group keeps improving by the regular killing of the weakest members. Stolen in its' entirety from Marty North & Greenfield Park. Update January 2017 replaced missing video with different one. Have no clue what was here before, and Marty's blog is gone, so no help there. There are a bunch of things on my mind these days. I put ten grand through my checking account last month: $10,000 in and a like amount out. Granted the bigger half of it was just transfers from college funds to colleges, but still, it was a stink load of money. I got a very nice Canon digital camera for Christmas. It's a 10 mega-pixel Elf. Ten mega-pixels is huge. With the default memory card (32 mega-bytes) it would only hold 11 pictures. 10 mega-pixels give a picture that is over 3,000 pixels square. My fancy schmancy desktop LCD is only 1280 by 1024. It would take nine of these screens to show one 10 mega-pixel picture. So I got to wondering how many pixels is enough? Display screens are going up in pixels and resolution, but how far will they go before the market is satisfied? How many pixels can the eye see? I know the center of your field of vision has a higher resolution than the periphery, but just how good is it? I remember a printer ad I saw some years ago that had three pictures of a woman in a red, white and blue bathing suit. The text went something like this: At 100 dots per inch, you can see that the woman is wearing a bathing suit. At 300 dots per inch you can see that it is wet. At 1000 dots per inch you can see that it is painted on. The accompanying pictures, printed at the three resolutions, demonstrated this. Anyway, I wanted to study up on this whole business of what we can see, and how we see it. Then there is carbon dioxide. Never mind the climate change mongers, I was more interested in when does carbon dioxide become toxic. How long can you survive in a closed room? How much fresh air do you need? I started looking into this a few weeks ago but got sidetracked. One thing I did learn was the CO2 makes up less than one percent of the atmosphere. Oxygen is about 20%, and Nitrogen is about 70% and the rest is lost in a haze. Of course, once I've got this all sorted out there is the whole climate change business. The one thing I have been looking for, and have not seen, is a good one page summary of where CO2 is coming from and where it's going. Some people like to point fingers at the automobile, but without a good overview of the situation I am not sure they should. Then there's the Ackermann function. I came across it recently in Stu Savory's blog, and I've been playing with it on my computer. 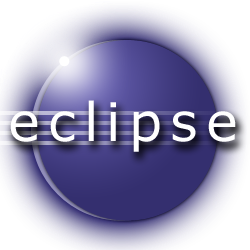 Using it to learn how to use Eclipse, a software development program for Linux. Also learning how to use a math library for doing arbitrary precision (numbers as big as you want to make them). Don't forget Betrand, a "functional programming language". I've been messing about with it also. It has an option to display it's output graphically, but the program is so old, I am not sure the graphics package still exists, or if it does, if it works. There should be some way to adapt it to work with a web browser, but that is going to take some study, or luck. The kids were home from college this weekend. It was nice to see them. Oldest son brought home a cold and a cough which he very kindly passed on to me. I still had a low grade sinus thing going on, so when you add this new thing, I was pretty miserable, so I have resumed a course of antibiotics that I started last month and then abandoned for reasons that are not really clear. I'm also working on re-reading a book ("Drown All The Dogs" by Thomas Adcock) I read last month. After I put it down I couldn't remember what I read, so after a couple of weeks I picked it up and started over. So far, everything I read, I remember reading before, but it's not like it's boring, it's like reading it for the first time. Weird. Anyway, this time I am making a bunch of notes and I hope to have something intelligent to say when I finally do finish it. Last week Stu put up a post that included a mention of Ackermann's function. It looked very simple, and being inclined to avoid doing any real work, I thought I would write up a little program to exercise it. The program was very simple, but the results were a little disappointing, if not unexpected. Stu warned that the results quickly exceed the bounds of the native 32-bit arithmetic of your typical Pentium processor. My immediate problem with the program was not the arithmetic, but the stack. Ackermann's function is recursive, which means it calls itself, and as simple minded as it is, it has calls to itself nested within calls to itself. Kind of like wheels within wheels. So the problem is that it runs out of stack space and crashes which means it doesn't deliver any results at all. I have been using Microsoft's (boo! hiss!) Visual C++ (Version 6.0 last copyright 1998, a very good product) for quite a while so I whipped up the first version of the program there, and when it ran out of stack space I was able to find the command to increase it (/stack:number). But stack space is the least of the problems with this program. The other problem is the ridiculously large numbers it produces. So now we are operating in the realm of fantasy, and Windows, as wonderful as it is, is not going to cut it. So off to Linux we go. Besides, I had installed the Eclipse software development program on my Linux box, and I needed to learn how to use it. This looks like a prime opportunity. After a bunch of fiddling around with Eclipse and my program, I finally get it to compile and run. All is well. Now, how do you set the stack size for this program? Help is no help at all. A bunch of Googling turns up ulimit, a program you can run from a terminal window to set a bunch of different memory allocation limits. So I set ulimit to some gloriously large number like a billion and let my program run overnight. It did nothing. It did not run out of stack space, which is something, but it also failed to complete the computation of A(4,0). Bah. So I'm playing around with ulimit this morning and I learn a few things. After the first time you set the stack size, you can only reduce it. You can enlarge it only the first time you run ulimit. ulimit works in units of 1KB, so the default setting of 8192 is equivalent to 8 megabytes. Anything above 4 million or so (2 to the 21st power, which translates to 4 gigabytes, the most memory that can be handled by a 32-bit processor) causes the stack size to be unlimited. 7 or below will keep my program from running. The shell (or CLI (Command Line Interpreter) if you prefer) immediately reports back killed. Last Monday night I heard Rick Lowe speak about some of his work. Mr. Lowe is part artist and part social activist. He has worked on several projects where he has been trying to do something to help poor neighborhoods. Perhaps bring some cohesiveness to them. After I left I got to thinking about what he had said and I realized that "neighborhood" meant something entirely different to me. He looked at it as a community of people. I looked at it as a location on a map. Most everyplace I have ever lived I new very few of the people in my "neighborhood". When I was in elementary school in West Seattle I knew, or knew of most of the people on my block. Most of them didn't have kids, so I didn't have much to do with them. But it was a small block holding 18 houses. I remember eleven of the houses, and probably about the same number of people. These days I see even less of the people in my neighborhood. Unless my neighbors happen to be outside when I go out to my car, I may not see them for months, and as long as they don't bother me, I'm fine with that. I have a few friends I see on a regular basis, but they don't live anywhere near me, and generally speaking we don't visit each other's homes. People move in and out of my neighborhood all the time. I only talk to two or three people on my street. I don't even know who most of them are. One family we knew packed up and moved to Arizona as soon as their kids were out of high school. We may do the same. Sense of community? If there is one it is more a community of the mind, rather than because we are neighbors. All this reminds me of talk about small towns. Great thing about small towns is everybody knows everybody else. Bad thing is that everybody knows about everybody else's business. Gossip keeps people entertained, but it can also cause all kinds of problems. I originally wrote this last Tuesday, but I wasn't too happy with it. I thought I could say something more or better, but the week has gone by and I haven't come up with anything better, so here it is. The daughter of an acquaintance came over Friday afternoon to "practice" her Cutco presentation on me. I agreed, even though my wife and I had been through one Cutco presentation before. (Actually my wife sat through that one, I didn't have the patience to sit through a sales presentation for something I didn't need). That one had cost us a few hundred dollars. This time I got out for under a hundred. Insidious, these Cutco presentations. Cutco makes kitchen knives. Made in America by real Americans. They are very proud of them. A good size set will run you a thousand dollars. They are very good knives, but I don't know if they are worth the money. When we got married we got a couple of sets of knives as wedding presents. They were nice enough, and we still have them. Some of them were poorly sharpened and I spent a great deal of time sharpening them by hand. After I got the initial sharpening done, it was not much effort to resharpen them, if I ever did. But that was a problem, because in spite of my good intentions, it hardly ever happened. And they were all straight edged knives, which has it's pros and cons. The pro is that you can sharpen them yourself with a whetstone, or, if you are a barbarian, one of those wretched steels. The con is that if you use them for cutting on a ceramic surface, like a pork chop on a dinner plate, the edge quickly gets destroyed by the much harder ceramic. A Canadian friend of mine claimed that they serve steaks on wooden planks in Canada, which makes sense. The surface of the plank will get scored, but the edges of your knife won't get destroyed. This is the same reason for using wooden cutting boards in the kitchen or butcher shop. The edges on Cutco knives are scalloped. They have their own term for it, but scalloped is what they are. The big advantage is, for steak knives anyway, is that while the points between the scallops will impact the plate, the scalloped edges never do, and so the knives remain sharp. And that has been our experience. We have never had to have any of the Cutco knives sharpened. But they do lose their edge. When these knives were new they were SHARP. Just grazing your finger across the tip between adjacent scallops would get you a cut. They've been knocking around our kitchen for a few years now, and the points have impacted enough plates that they have been somewhat blunted. Teresa demonstrated this for me by having me slice a piece of leather with one of my old Cutco table (steak) knives and a new one. The old one cut well enough, but the new one sliced through the leather easily. Then there are the handles. Manufacturers of knives with wood handles don't want you to put them through the dishwasher, but I am a lazy sort, I am a man and I have a severe aversion to washing dishes, especially by hand. So they go in the dishwasher, and after awhile, the wood handles suffer for it. They start to look weathered and the rivets get loose. It's not much trouble to fix. I have tightened several rivets with punch and a hammer, and I have even applied some linseed oil to a couple of well-weathered wood handles. But it's a bit of a hassle, especially if you don't have any linseed oil. So the current status of our knives is that the Cutco blades are in much better shape than our old wedding present knives. So there are pros and cons to buying Cutco knives. On the pro side they are very good knives, they seldom, if ever, need sharpening. They are made in America. They are sold by college students, so you are helping out people who are trying to make something of themselves. On the other hand, they are expensive. 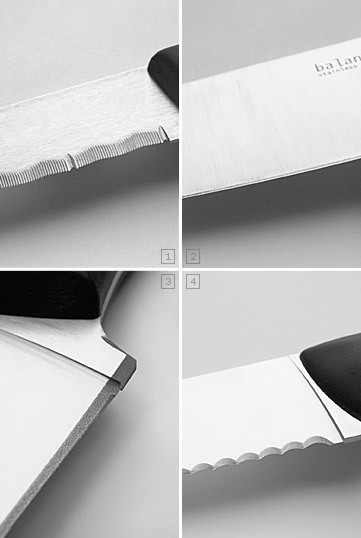 Four different knife edges: 1) Serrated, 2) & 3) Plain (#3 is hardened) and 4) Scalloped. A fine film. Went to see it last night with my wife. Lots of action, lots of taking out bad guys. None of this "don't do it George, don't lower yourself to their level", just good old fashioned punching, knifing and shooting. Much more satisfying than your typical cop drama where the heros restrain themselves. "The term was first used by President Richard Nixon in 1971, and his choice of words was probably based on the War on Poverty, announced by President Lyndon B. Johnson in 1964." - from Wikipedia. It looks like we are finally getting what we asked for: a real war. 6,000 people were killed last year in Mexico in this war. More people are dying in Tijuana in the drug war than in Baghdad. Mexico City is now the kidnap capital of the world, and number two is, are you ready for this? Phoenix, as in Arizona, with over 350 kidnappings last year. Problem is that it may be too late to do anything substantial about it. There are too many people with a vested interest in keeping drugs illegal. Too many people making too much money, too many careers and too many bureaucracies dependent on fighting this war. Low Intensity Conflict is coming to America. Keep your head down. A post by Tam got me started on this. Previous post (of mine) on this subject: What if drugs were legal? I became an anarchist only recently. It was no longer ago than around mid-1891 that I threw myself into the revolutionary movement. Previously, I had lived in circles wholly permeated with the established morality. I had been accustomed to respecting and even cherishing the principles of the nation, family, authority and property. But those educating the present generation all too often forget one thing – that life, indiscreet with its struggles and setbacks, its injustices and iniquities, sees to it that the scales are removed from the eyes of the ignorant and that they are opened to reality. Which was the case with me, as it is with everyone. I had been told that this life was easy and largely open to intelligent, vagarious people, and experience showed me that only cynics and lackeys can get a good seat at the banquet. I had been told that society’s institutions were founded on justice and equality, and all around me I could see nothing but lies and treachery. Everyday I was disabused further. Everywhere I went, I witnessed the same pain in some, the same delights in others. It did not take me long to realize that the same great words that I had been raised to venerate: honor, devotion, duty were merely a mask hiding the most shameful turpitude. The factory-owner amassing a huge fortune on the back of the labor of his workers who lacked everything was an upright gentleman. The deputy, the minister whose hands were forever outstretched for bribes were committed to the public good. The officer testing his new model rifle on seven-year-old children had done his duty well, and in open parliament the premier offered him his congratulation. Everything I could see turned my stomach and my mind fastened on criticism of social organization. The criticism has been voiced too often to need rehearsing by me. Suffice it say that I turned into an enemy of a society which I held to be criminal. Momentarily attracted by socialism, I wasted no time in distancing myself from that party. My love of liberty was too great, my regard for individual initiative too great, my repudiation for feathering one’s nest too definite for me to enlist in the numbered army of the fourth estate. Also, I saw that, essentially, socialism changes the established order not one jot. It retains the authoritarian principle, and this principle, despite what supposed free-thinkers may say about it, is nothing but an ancient relic of the belief in a higher power. (...)In the merciless war that we have declared on the bourgeoisie, we ask no mercy. We mete out death and we must face it. For that reason I await your verdict with indifference. I know that mine will not be the last head you will sever (...) You will add more names to the bloody roll call of our dead. Hanged in Chicago, beheaded in Germany, garroted in Xerez, shot in Barcelona, guillotined in Montbrison and in Paris, our dead are many; but you have not been able to destroy anarchy. Its roots go deep: its spouts from the bosom of a rotten society that is falling apart; it is a violent backlash against the established order; it stands for the aspirations to equality and liberty which have entered the lists against the current authoritarianism. It is everywhere. That is what makes it indomitable, and it will end by defeating you and killing you. I like to think things have improved since then, but there is still more than enough moral turpitude to go around. From Wikipedia. Tip of the hat to "get off of my lawn", er, "View From The Porch". Nothing wrong, except it doesn't work. The toilet in the upstairs hall bath has been making funny noises for a while. Went to fix it yesterday and naturally it was dead quiet. Downstairs toilet had been making noises earlier and I discovered that the flapper valve had some kind of mold or something growing on the sealing surface, causing it to leak. I figured the same thing was going on here. It's easy enough to fix, as long as the shut off valve is working properly. The flapper valve just clips onto it's pivot points, so you just push up on the two arms, undo the hook and there you are. The mold, or algae or whatever it is comes off just by rubbing with your fingers. A little running water to wash away the debris and five minutes of rub-a-dub-dub, wipe off the sealing surface and put it back in, and you're good as new. Or not. Now the water won't come on. Open up the top of the Fluidmaster valve, looks good, put it back. Water fills the tank, but now it won't shut off. Repeat this drill two or three times and we have no progress. Go to home depot today and buy a new valve top. Put it on and everything works fine. Okay, the toilet is working now, but I still have two problems. 1) What's wrong with the old valve? and 2) just how does this valve work in the first place? The float is connected to a lever. The other end of the lever is connected to a pin. The pin slides through hole in the center of the diaphragm. It does not actually push on the diaphragm, it just slides up and down. On close examination, I can see that the top half of the pin has a smaller diameter than the bottom half. There is a collar that is on top of, and part of the diaphragm. There is a small hole in the side of the collar. So if the float pushes the lever up, the lever pushes the pin down, the smaller diameter of the pin reaches the hole in the side of the collar, and air is vented to the top of the diaphragm. So the valve would open, right? You would need water pressure pressing down on the entire diaphragm to overcome the pressure of the water from the inlet pushing up on the smaller center section of the diaphragm. The area over the top of the diaphragm is not sealed, any water up there would just flow out the top of the valve. This does not make any sense and is extremely annoying. 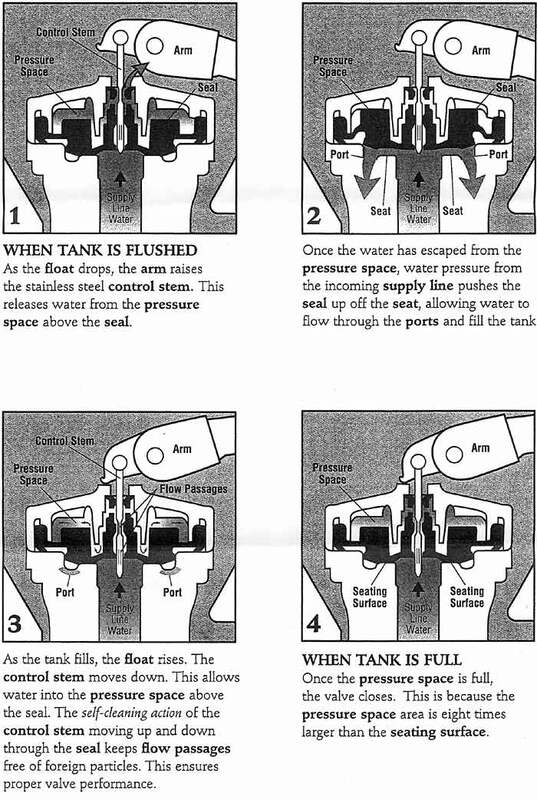 A second round of searching the web produces this page, which does a pretty good job of explaining with illustrations, just how this mystery piece of equipment works. It isn't at all obvious. Update March 1, 2009: Fix didn't take. If I'd left it alone it probably would have been fine for a while, but it had been making noises, so it was definitely headed for trouble. Replacing the fill valve fixed one problem, but evidently we didn't clean the flapper valve well enough because periodically the fill valve would open for few seconds and then shut off again. Went in and cleaned the rubber washer on the flapper valve again yesterday and found a very little bit of stuff still adhering to it. I think I got it this time because no more complaints about the toilet turning off and on. Putting the rubber washer back on the flapper is kind of a trick. It is just a little too thick for the slot provided for it. Stretching the washer thins it out enough that it will slide in the slot, but by the time you've worked your way all around the outside, you are left with a bunch of extra washer all piled up in one spot. What seems to work better is to just push the washer down over the central projection. This leaves the upper edge of the inside of the hole in the washer facing up, it hasn't slid into the hole. Just pushing down of this visible edge is enough to get it to tuck into the slot. Work your way all the way around and you should be good to go. I have been out of work for almost two years now. I spent a good deal of that time on a conventional job search. I had a number of interviews and most of them went pretty well, but I did not land a job. There could be any number of reasons for it, but I suspect the biggest one is my low tolerance for B.S. See the letter from Anytown, USA, for a similar story. So this year I decided to try and change my stripes. I would go out and talk to people. I might just find something interesting and useful to do. To that end, I started looking for public meetings of small groups that I could attend. My first idea was the local Chamber of Commerce, but as I looked around I discovered more groups, more events and more calendars. Some of the meetings have been more interesting than others, some have had good speakers, some, not so good. But they have all been very instructive. Yesterday evening I went to two events in downtown Portland. One was a presentation by the Portland City Club at Jimmy Mak's, a jazz nightclub on the West side. The other was an obscure computer programming gang at CubeSpace, a community office space on the East side. I took the train to downtown Portland, and then I walked. Walking from Jimmy's to CubeSpace took me across the Morrison Bridge, and that was the adventure. Portland is bisected North and South by the Willamette River. There are eleven bridges across the Willamette in Portland. This Google Satellite View shows the eight centrally located ones. This picture shows the same eight plus the two at the Northern extreme: the Burlington Northern Railroad Bridge (no auto traffic) and the St. Johns bridge. Portland on the West side of the river is downtown proper. The East side is East side. The East side along the river is a snarl of freeways. The four bridges in this view are (from top to bottom) are the Steel Bridge, the Burnside Bridge, the Morrison Bridge, and the Hawthorne Bridge. My trek across the river took me across the Morrison bridge. Note the splay of on-ramps at the West End and the cloverleaf tangle on the East end. This made just getting on the bridge a bit of a challenge. Atul666 has a long story all about pedestrian access to the Morrison bridge, along with some good photos. Getting off the bridge was not as difficult as there was only one way to go, but it was more, er, shall we say, interesting? I would say scary, but I'm a man and men don't get skeered. The red marks indicate pedestrian access on the North side of the bridge, the blue ones indicate access on the South side. I took the North side route as it was handier, and I wasn't aware of what was waiting for me on the East end. When I got to the East end of the bridge, the sidewalk veers off to the side and down a flight of stairs. Pitch black going down the stairs. Then there is a catwalk underneath the roadway. There is a big pile of stuff lying on the catwalk. As I approach, it moves and I realize there is someone sleeping here. I walk by, then up the stairs on the other side of the roadway and back to the sidewalk. After I got off the bridge (down the stairs in the red circle) I proceeded Eastwards, still under the bridge where I came across several other people camped out for the night. Half a block farther on there were people eating and drinking in a pretty nice looking restaurant. Coming back I jogged across the on ramp to avoid the black stairs and the sleeping person. Skeered, polite, or lazy? Your choice. I did not see anyone while I was crossing the bridge the first time. I did see one other person Eastbound on the South side when I was returning. Is the term “senior citizen” offensive? No. Now get the hell off my lawn. Ho, ho, ho! Stolen from Dustbury. Iowa Andy changes the oil in his truck! A fellow Hillsboroite (Hillsboronian?) writes about Nietzsche and Gear Lust. The typewriter alone is worth the click. I seem to have stumbled into lawyer land this afternoon. This website features a quill pen writing out the title of the page, complete with sound effects. Reminds me of a CIA page that did something similar. Is That a Kielbasa in Your Pocket? When judicial law clerks go rogue. Stolen from Courtoons, by David Mills. I'm not a big basketball fan, but two of my favorite people are. My wife is a big fan of the Portland Trail Blazers, who have been having a pretty good year so far. Mr. Dustbury (whom I don't actually know, but he writes a mean blog) is a big fan of the brand new Oklahoma City Thunder, formerly the Seattle Sonics. Last night these two teams met and Portland got trounced, much to wife's disappointment and much to Mr. Dustbury's elation. Oregon Live has some photos, via AP. This comes under the heading of what to do if your computer systems has been compromised. The typical concern is some unauthorized person gaining access to your computer system and wreaking havoc. The fact that we are talking about it at all means that there are security holes in Linux systems. They may not be as plentiful or as well known as the ones in computer systems running Microsoft Windows, but they are there. On the other hand, he is only one in his shop of twenty odd people that works on Linux systems. All the others work on Windows systems. While your interest no doubt lies with your computer system, where security becomes important is at the commercial internet web server farms, where there may be dozens or even hundreds of computer systems, all connected to the web, all containing data that needs to be protected from corruption and/or unauthorized access. "Unauthorized access" can be done for any number of reasons. One of the most common is spammers trying to co-opt computers to send out more spam (unsolicited e-mail). Others may be industrial spies or just common criminals looking for useful information, disgruntled former employees looking for revenge, vandals looking to trash something, or just pranksters getting their kicks by getting past your security. Hal started out with generalized blandishments about about not changing the state of the compromised system. Basically this means pulling the plug. The problem is that what is going on in RAM in the computer is happening much too fast for a person to follow. While you might be catch sight of some unauthorized process in the act, most attacks will write something to the disk. And anything you do while the computer is still running is going to cause data to be written to the disk, possibly overwriting evidence of tampering. Even an orderly shut-down will write some data to the disk. Pull the plug and then make a copy of disk using another machine. Do not boot from the disk from the compromised machine. One trick that can make your life a little easier is if you have empty space on your disk that is larger than the whole compromised disk. You can copy an image of the entire disk into a file. You can then mount it as though it was a real disk. This saves you from having to buy and connect another disk to your system, though with the rapidly increasing size of disks it may a toss up as to which disk is going to be bigger, yours or the suspect target disk. Once you have made a copy of the disk from the compromised system, then the real computer geek work begins. In case you haven't noticed, computer disks are big these days. You can buy a terabyte of storage for under a $100. So just looking around for some useful information is going to have the results of buying a lottery ticket: a waste of time. To that end there are some tools (computer programs) that can be used to locate files that have been tampered with. In order to use the tools, it helps to have some understanding about how the data is arranged, or in programmer's parlance, structured. Computers store all data on disks as binary. A disk contains basically just a long string of ones and zeros. How you interpret that binary data determines whether you can retrieve any useful information. Binary data can be interpreted as words or numbers or code or, for our purposes, as pointers to other places on the disk. Yes, pointers are just numbers, but the are special numbers because they are key to making sense of all the rest of the data on the disk. Most of Hal's presentation, and the most interesting part, was about the various tools and techniques used to figure out what had happened. What was changed? What was deleted? What was added? Any one of these things, if done at the right place could cause irreparable harm. This is why computer security has gotten to be such a big issue. It was a pretty dry, technical discussion until a couple of hiccups triggered an avalanche of laughter. The hilarity threatened to snowball out of control, but somehow we got our selves under control. Geeks, I think, may in general be would a little too tight. Just a knick in our armor and we come unglued. All this was like a trip down memory lane for me. Fifteen or twenty years ago I wrote a a couple of tools for recovering data from damaged disks. It wasn't a security issue then. Something had corrupted the data on a customer's disk, and I went in to try and recover it for them. Failure to make back up copies of their important data was the root cause of the problem, but it gave me an interesting technical challenge. In both cases (I think there were only two) I was able to retrieve some data, though in one case it left the customer with about a hundred unnamed files they were going to have to sort through to find their lost information. My cousin John forwarded an email to me with bunch of pictures. In the next series of pictures the water froze the instant the wave broke through the ice. That's what it is like in Antarctica where it is the coldest weather in decades. Water freezes the instant it comes incontact with the air. The temperature of the water is already many degrees below freezing. Just look at how the waves froze in mid-air!!! I thought you were talking about God. 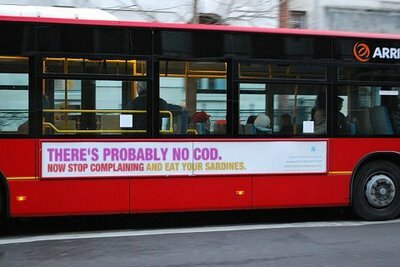 Stu has a post about an atheist advertising campaign. They have a deal to make your own sign. This is the default slogan. I couldn't have said it better myself. I gave my son a ride to his friend's house this morning, just a couple of blocks away. Saved him five minutes. Boy, I tell you what, kids these days. Sheesh. We won't talk about their parents. When he gets out of the car, by way of saying good bye, he says "peace, man", which got me thinking. When I was his age, the Vietnam war was in full swing as was the Peace Movement, and we had all the long haired pinko hippies flashing the peace sign. Not too long before that the "peace sign" meant "V for Victory", and during WWII that meant to keep killing the enemy until they gave up, or they were all dead. So Victory eventually meant peace, but to get there we had war, big time. So I'm wondering how did the sign for war become the sign for peace? I think that was the only song I ever heard that ever talked about just what the military industrial complex was doing for our country. Kind of like the swordsmen in Vatel. What's that funny German word for enjoying somebody else's misery? Schadenfreude? I'm sorry, I can't help it. 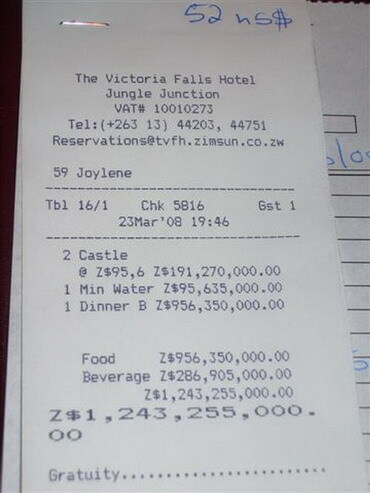 I keep waiting for Zimbabwe to implode, but they seem to just keep circling the drain. I found this on this blog. I was talking to a guy at DevSIG a week or so ago, and he was lamenting the state of venture capital. He was telling me that the average return on venture capital investments since the year 2000 was about 2%. With those kind of numbers, who is even going to consider putting any money into a new venture? This is similar to the logic saying that venture capital is not for everybody. And it's true. Venture Capital guys are not looking to make a nice reliable 5 or 10 percent return on their money. They are looking for the next big score: cell phones, iPods, Blackberries. They are willing to gamble millions of dollars on somebody's big idea IF they can imagine it being a tremendous success and earning billions of dollars. If they bet wrong and all their money vanishes occasionally, that's okay, that's the way ball bounces. Maybe the next one will hit it big. So they keep coming back, looking for that one deal in a million that's going to be the breakaway hit of the year. Every movie is made like this. Someone sells the concept, someone puts up the money (20 million on black to win), a crew goes to work and puts the story on film. Once it's in the can, you sit back and chew your fingernails until the first gross receipt numbers come in. Then it's Champagne (if you backed a winner) or beer (to cry in if you didn't).